Healthy Vegetable Fried Rice is great as a meal or a side, flexible, delicious… and well, not fried. This healthy fried rice recipe makes some easy substitutions to keep your favorite Asian inspired dish on the menu. 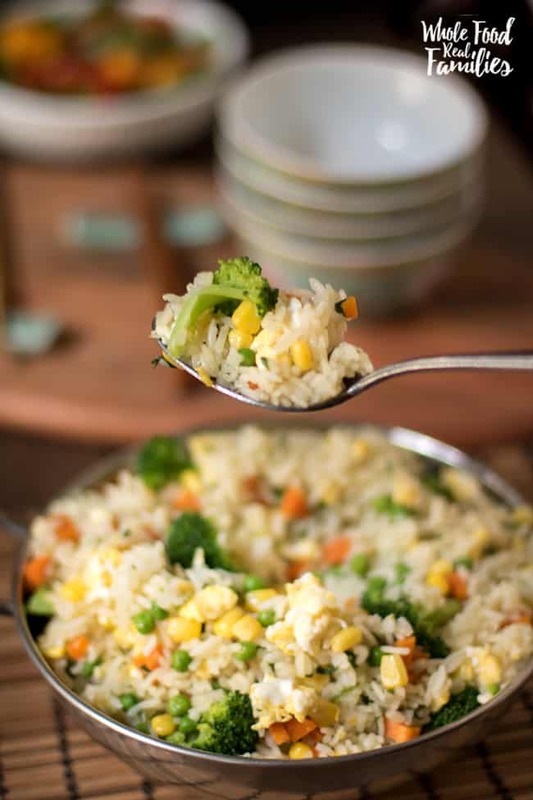 A Healthy Fried Rice Recipe for a Family-Friendly Dinner! 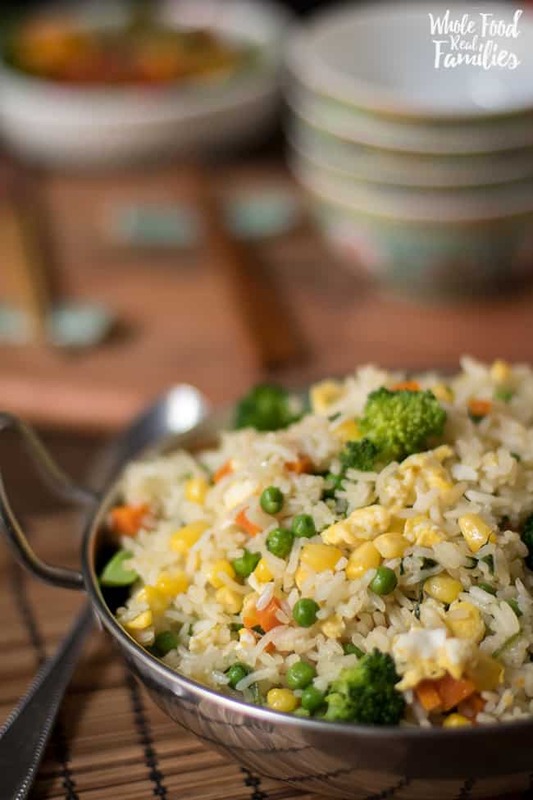 Healthy Vegetable Fried Rice is a fun way to get everyone excited to come to the table. 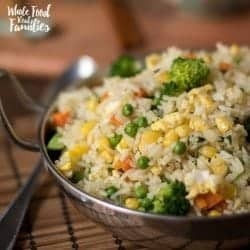 I remember when my oldest child was little, Vegetable Fried Rice was literally the ONLY thing I could get her to eat if we went to an Asian restaurant. If she was feeling really brave, maybe we could get some chicken in that fried rice. But she would not touch anything else. Now… please… Asian is her favorite and she can eat us out of an entire paycheck if sushi in on the menu. But nobody can eat out all the time… And we certainly don’t want to. It is definitely a lot healthier (and cost-effective) to eat most of your meals around the table at home. So we learned to make some healthy substitutions in our favorite fried rice. And I learned some time savers that helped me get dinner on the table on a few otherwise hopeless nights. I admit it. Sometimes I am a big cheater at this recipe. If I am making rice as a side dish during the week, I often double it and plan for Healthy Vegetable Fried Rice later in the week. That means I cook the veggies first, add the rice with a little broth and soy sauce until everything is hot and fold in the protein. Yep, if you are counting that is dinner in about 10 minutes. 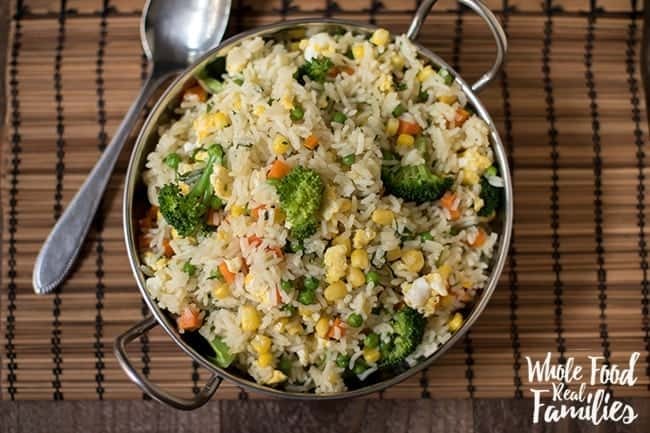 And this Healthy Fried Rice recipe heats up great for lunchboxes the next day. There is a lot of space to wiggle with the frozen veggies too. Whatever your family will eat works. We generally use long grain basmati brown rice… because I like it. 🙂 But most rice varieties work just fine with a little adjustment in the liquid. Jasmine rice is awesome too! Fried Rice is Easy and Inexpensive! 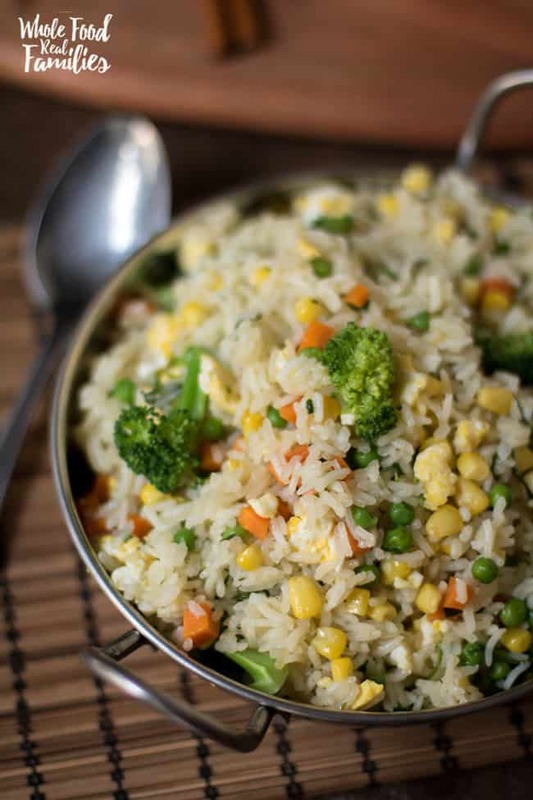 In case I have not convinced you to try this recipe already – Healthy Vegetable Fried Rice is SUPER CHEAP to make! Rice, frozen veggies, eggs, some broth. These are pantry staples that pretty much always live in my house. A few years ago, I noticed pre-chopped, frozen recipe starters in the freezer section and they have been in my freezer ever since. From frozen onions to frozen mirepoix, or frozen soup veggies — these handy little starters shave so much time off of making dinner during the week. (And alleviates the vegetable chopping that is my least favorite part of cooking.) Not to mention, frozen veg is cheaper than the fresh stuff. Kind of a bummer I know, but there we are. So when things are feeling leeeeeaaaannnn… we have fried rice for dinner! Want to turn this vegetable fried rice into a meal with more protein? Cook bite size chicken pieces, beef, or shrimp first, set it to the side, then fold it in after the rice is finished cooking. 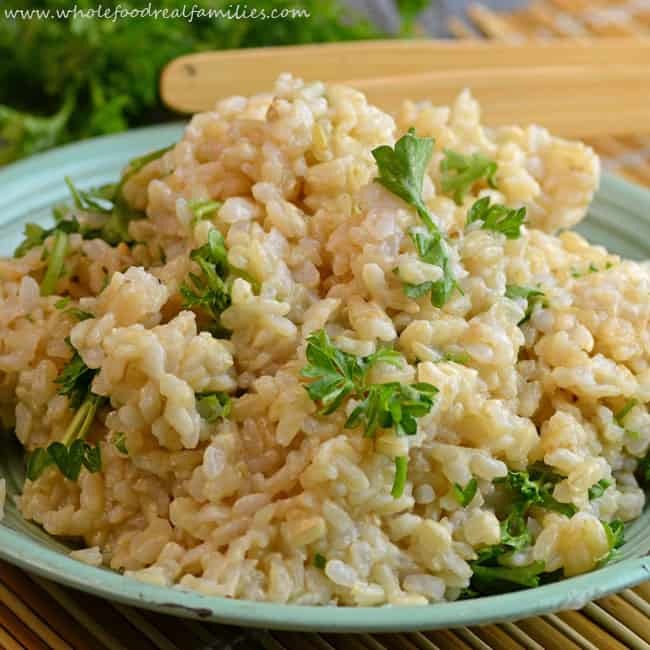 This Herbed Brown Rice is so tasty that nobody will ever complain about brown rice again. And this Simple Brown Rice Stir Fry is a winner! Are you on a Keto diet? Or just looking for a way to eat more veggies? This cauliflower rice is super easy and surprisingly delicious. You can make fried rice with cauliflower too! First, rinse the rice a couple of times and allow it to sit in lukewarm water for 30 minutes. I always do this prior to cooking the rice, as it cuts down on cooking time. Drain rice. Heat oil in a sauce pan and sautee the onions until soft and translucent. Add the rice and stir for a minute. Next add the garlic and the carrots. Stir just to combine the ingredients. Pour in the stock and soy sauce, lower heat, cover and allow to cook on low for 10 minutes. After 10 minutes, check on the rice. If yours is still a bit hard and there's no liquid left, keep adding 1/3 cup of stock until the rice is cooked all the way. Different types of rice will cook differently and the cooking temperature will affect the amount of time it takes. If you find yourself in a situation where the rice is done, but you still have liquid in the pan - open the lid and allow it to cook off. Once the rice is cooked, turn heat off and mix in the frozen vegetables. At this point, you may add the scrambled eggs, and any other protein you wish. Hooray! That makes my day! Great recipe – quick, easy and delish! Hi is this white rice or brown ? Does it matter?